1986 XT600 Ténéré (0U26) - Communication Plaza | Yamaha Motor Co., Ltd. This was a Dakar Rally factory machine with a specially designed frame mounting an engine based on that of the production off-road model XT600. After debuting in 1983 as a modified version of the XT600, the performance of the engine and suspension was upgraded as speeds in the rally grew faster every year. Meanwhile, know-how was fed back into the machine development to achieve the durability, serviceability and comfort necessary for long-distance racing in the desert. 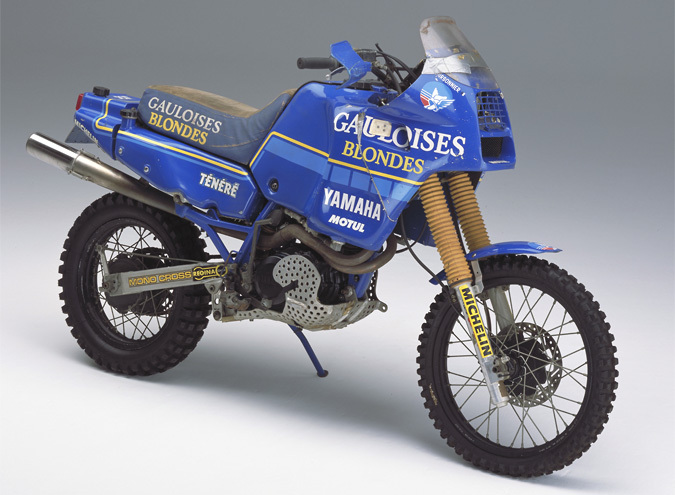 In '86, Thierry Charbonnier placed 4th riding the machine on display. Notice: The coloring and logos on the models on display have been reproduced to match the actual appearance in their day, and in the case of tobacco maker logos, their reproduction is in no way intended as promotion of the products or brands involved. The Yamaha Motor group accepts no responsibility regarding the damaging effects of smoking on health, etc.